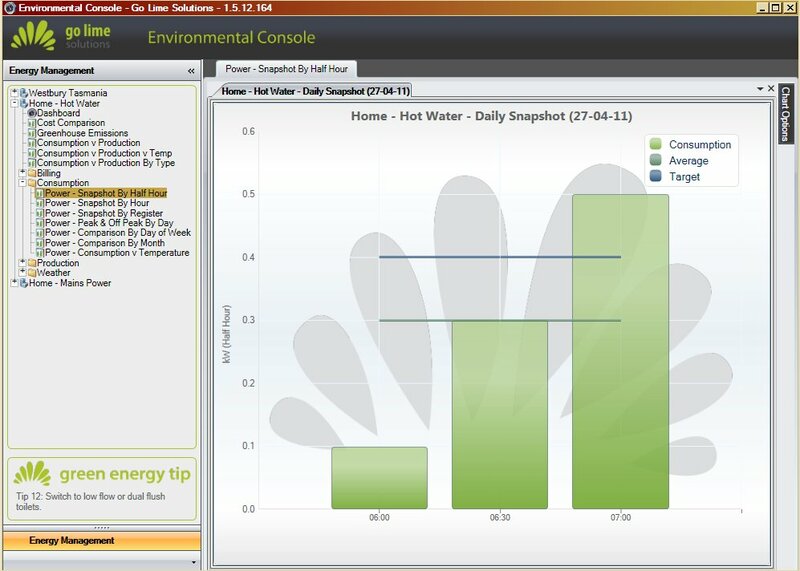 In this update: New energy monitor and great software to measure electricty consumption. Last time I updated this blog I spoke about HEAT kits, eco switches and LED Mitts. Well the latest new is that the LED Mitts are suitable for a 5 watt led replacement for a halogen globe but not suitable for our 11watt replacements for 50 watt halogen. The reason for this is that although LED’s run cool their electronics give out a bit of heat. Unlike Halogens which actually heat up the globe and are just a heating element in a gas LED’s themselves do not emit heat but the electronics do. If this heat is allowed to build up around the LED unit which is what could happen with the LED Mitt it could drastically shorten the life of the LED’s. Now for some cool pieces of kit. Without a fuel gauge you don’t know when you will run out of fuel. You can guess but that is not too accurate. Well it is the same with energy. If you are trying to save energy in a home it is really difficult if the only monitoring you have is an electricity bill once every three months. It might give a rough idea but really rough. 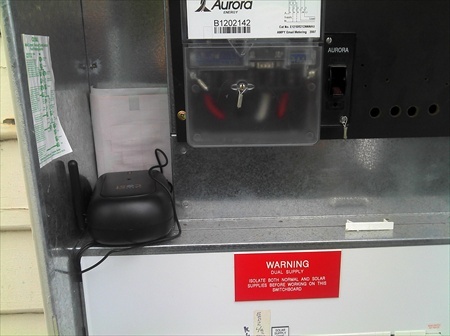 I had looked at several energy monitoring devices but either they were fairly inaccurate or very expensive or hard to retro fit. Then as theswe things do along came a great thing, well two really. 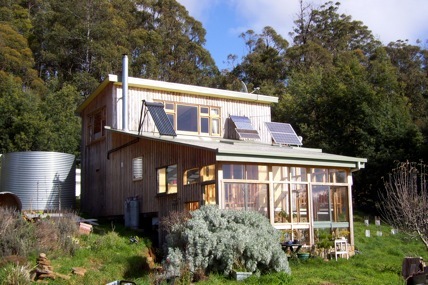 I was speaking to a couple of people who are part of KEENER, a sustainability group local to Sheffield, Tasmania. 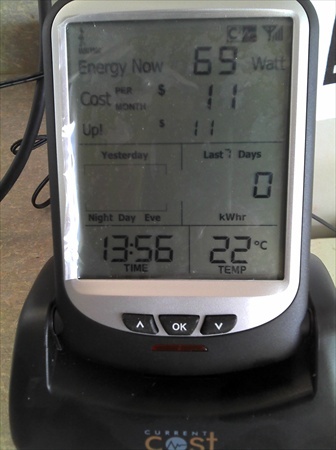 They were organising a group purchase of energy monitors sold by Smart Now They are called EnviR and they wirelessly transmitt data every six seconds from the power box to a display monitor. This tells you what you are currently using. A CT clamp is put around the main power wire in the fuse box. this needs to be done by a licensed electrician. I also got a second CT clamp and put it around the hot water feed. The device comes with a USB cable to connect to a PC. The really clever part of this whole thing is not the EnviR which while a clever piece of equipment only tells you how it is in real time and shows the sum power being used. 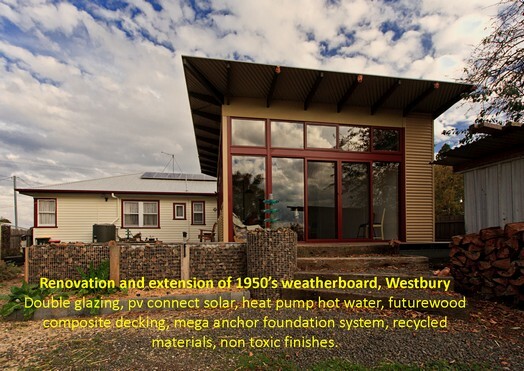 (Sum of mains power and hot water) No the really clever part is the software which is supplied by a local Tasmanian software company Go Lime Solutions . 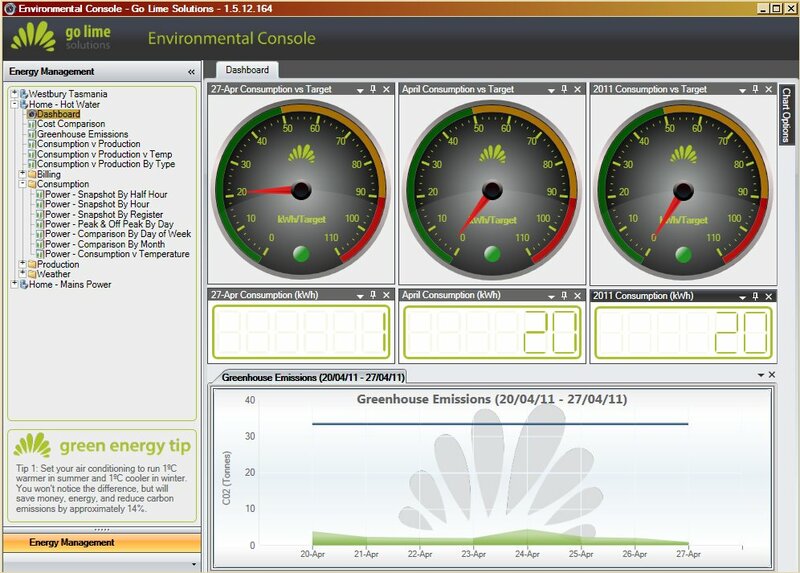 This software, called Energy Tracker, takes all the data that is transmitted and shows it on a power meter on your PC as well as storing it all in a database which you can access via a reports page. All the equipment can be purchased from Go Lime Solutions. They have been excellent with after sales service and sorting out a few glitches in my computer system. 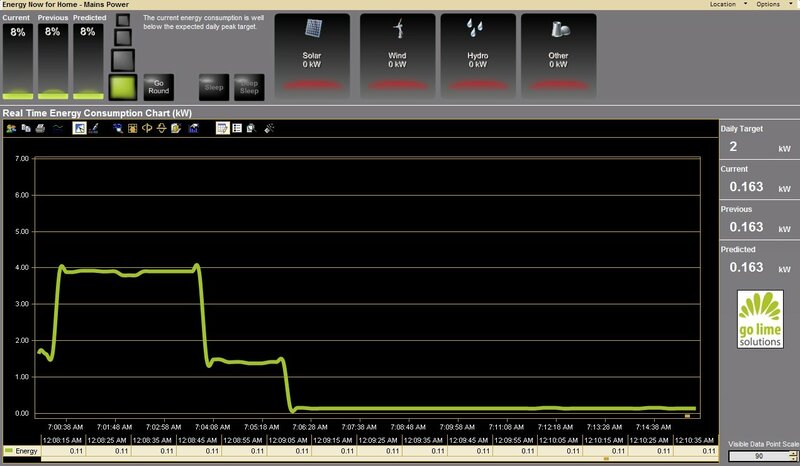 The power meter can be a small colour coded meter that is green if you are using power within the parameters that you specify, turning orange as you near capacity and then red when it goes over; and expanded to a full page with a graph of use that goes back quite a few days. This can tell you alot. You will see when a kettle or another large appliance is switched on or how much power is being used with evrything just on standby. The clever bit is that it seperates out all the information that is fed in to the EnviR and puts it into seperate reports. Now the Envi R can pair up with ten wireless transmitters which can run three CT clamps each which is up to 30 channels. This means that you could monitor multiple power and light feeds if you wished and track down all that power that might be being used and you just don’t know. Ther are a variety of reports including hourly, half hourly, cost comparisons and lots more. Go Lime are soon releasing even more in depth reporting. All the data can be copied into Excel or graphs copied to paste into documents. The system is around $200 for a household size which is really cheap. You should be able to save that very quickly on your power bill by being able to measure your usage. In our case with the hotwater feed hooked up I have been monitoring when our Siddons heatpump hot water service comes on to reheat. Turns out it likes to come on at night when it is coolest outside. Not the most efficient time for it to come on as it has to work harder with cooler air. We shower in the morning, the HWS heats up water just after showering and then it takes approx 15 hours for it to cool down enough for it to want to heat more water. This is at ambient temps of approx 18C during the day and maybe 8C at night. We may change our water use habits or put a timer on the HWS so it does not come on at night.Hot Water hourly graphI have just built an insulated box around the HWS and will be able to monitor the difference in[power use. Our other power use is very low as we TURN STUFF OFF AT THE SWITCH NOT THE STAND BY!! I will monitor our HWS and update it in a few weeks.